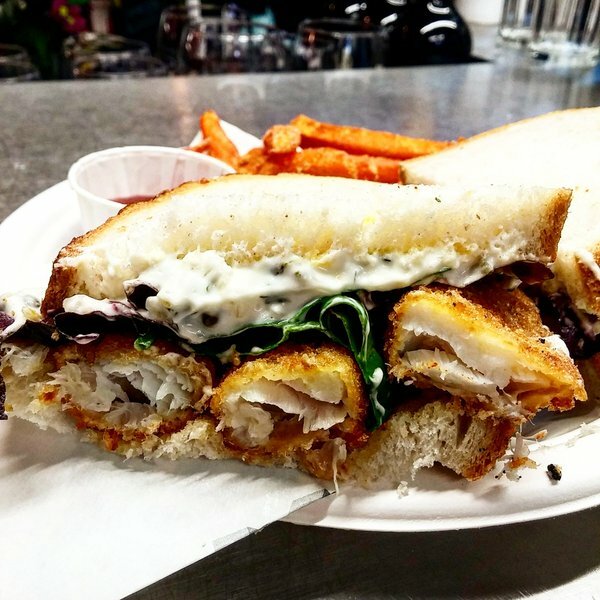 2 Fingers - who make epic fish finger sandwiches - are holding a lunchtime pop-up for January 2017 - serving every Thursday and Friday lunchtime from 5th Janaury at The Canvas Cafe in Hanbury Street, off Brick Lane. I've had Rick's fish finger sandwiches, and they're great! To this staple he's adding 'old skool' - made with Birds Eye fish fingers (His standard sandwiches are made with hand made fish goujons), plus Bahn Mi, vegetarian and crab options too. Well worth the trip! "Epic homemade fish finger sandwiches brought to you by 2Fingers - a lunchtime takeover every Thursday and Friday in January at The Canvas Cafe. Hot off the UK’s Street Food circuit 2 Fingers – ‘London’s original fish finger bad boys’ return to the heart of London for an exclusive pop-up at The Canvas: café & creative venue - London's first Happy Café. Located on Hanbury Street, off Brick Lane, The Canvas’s multi-purpose bespoke event space with re-claimed furnishings and upcycled décor will be providing the back drop for 2 Fingers latest gastronomic line-up. 2 Fingers beloved fish finger sandwiches are packed with sustainably sourced and responsibly caught North Atlantic cod loin steaks, except for the ‘Old Skool’, which comes courtesy of the Captains table! Introducing the 'Old Skool’ - an all time classic - with original Birds Eye™ Fish Fingers on white square tin loaf, with lashings of Heinz Tomato Ketchup. Those with a more refined palate there's the esteemed ‘Po$h’, on artisan bloomer bread, by way of award-winning social enterprise Dusty Knuckle Bakery, served with a real deal hunky chunky home-made tartare sauce. And for those who like to swing both ways, there’s the ingenious ‘50:50’ – half an ‘Old Skool’ sarnie and half a ‘Po$h’ sandwich. Fish fingers don’t float your boat?! Enter the ‘BA Baracus Bean Buster Burger’(v), made with three types of beans, lightly spiced, mild cheddar cheese and zingy home-made fresh salsa housed in a demi-brioche bun. Crab-lovers…you’ve arrived! Having made its debut earlier this year in the summer with unprecedented demand, 2 Fingers Soft Shell Crab Burger, with a seasoned panko crumb, napa-slaw & Sriracha aioli, also in a demi brioche bun. Other retro numbers include Cod n’ Smoky Bacon Fish Cakes and Prawn Cocktail – classic 70’s throw back; and for those of you keeping your carbs low – ‘Just Fingers’, that’s right you guessed it, all the 2-fingered-licking fun, minus the bread! For your bits on the side there're the deliciously more-ish 2 Fingers Sweet Potato Fries and Yuca Fries aka Cassava Chips. Lighter options include the Classic Potato Salad."